What’s in a drop? Well, lots. A drop of blood can tell you if you’re sick, a drop of water can ruin your new computer… A drop can do more than you think. And now, a drop of fluid could be enough to run a hundred biochemical tests. Why is this important? For research labs and pharmaceutical companies, testing and screening biochemical compounds are some of the most resource-intensive processes. Running all the tests and screens involved in the creation of a novel drug costs millions of dollars and can take hundreds of man-hours. But with emerging technology, these tasks are no longer so painful. A number of technologies are emerging that will help companies and researchers run tests more effectively. These technologies combine low-cost assays with speed and sensitivity, turning the daunting task of running a hundred thousand assays into the mundane task of hitting a few buttons. One such promising technology is digital microfluidics (DMF), an area of research based on the manipulation of tiny (&lt;1 microliter) droplets using applied voltages. By using smaller droplets, testing costs are significantly reduced. At the same time, the use of electrical signals rather than moving parts means that DMF is relatively easy to automate. However, there’s no such thing as a free lunch, even if it is a small one. While scaling down has its advantages, it also comes with a host of new challenges of its own. In the world of biochemical detection, the smaller your sample is, the harder it is to detect compounds. Think of it as needles in a proverbial haystack: If you have a barn-sized haystack with thousands of needles, it’s easy to detect the presence of needles. Just dive in! This process may be a bit of a pain, but you’re bound to detect a needle or two. But how do you dive into a haystack the size of a thimble with a needle only a few molecules long? Just like the haystacks, as the size of a test sample decreases, it becomes more and more difficult to find desired molecules. However, this challenge appears for the most part to be manageable through the use of sensitive modern detection systems. Although there are still limitations to detection capabilities, researchers have achieved equivalent and sometimes even better sensitivity than has been observed on the macro-scale. For example, Dr. Miller from the University of Toronto reported the DMF limit of detection (the smallest detectable quantity) of fluorescein diphospate, a common microscopy dye, to be approximately 40,000 molecules, as compared to 3,000,000 for a conventional assay. Another challenge of downsizing is evaporation – it doesn’t take very long for a nanoliter of fluid to disappear! This adds an extra complication to manual work performed with the smaller droplets, since you need to keep your sample humidified so it won’t disappear. On machines, however, evaporation is less of a problem as the environment within a machine can be more easily controlled. DMF is somewhat different from the fluid manipulations you might expect to see in a typical washroom. Rather than pushing fluids along, such as in a pipe or channel, digital microfluidics relies on surface tension to move droplets over a surface. The closest macroscale analogy would be a great oak tree, which can transport water several dozen meters up from its roots to its leaves using surface tension. To understand how DMF works, it’s important to remember that the laws of the universe depend on size. Things that could change an electron’s life forever would have no impact whatsoever on a bowling ball. Likewise, laws that are an important part of our lives, such as the law of gravity, don’t really apply to droplets on the micro scale. For DMF devices, the motion of droplets comes from wetting caused by surface tension in the droplet. A good example of this can be seen in the macroscale in a glass of water. The surface of the water, rather than being flat as you might expect, actually curves up slightly where it touches the glass. The phenomenon you just observed is called a meniscus. Menisci are formed because the adhesive force between water and glass is stronger than the force pulling the water molecules down. In effect, the water molecules are "spreading" along the vertical surface of the glass with the help of the water-glass adhesive force. This spreading out of a liquid along a surface is called wetting. The extent of wetting depends on the strength of the interaction between the liquid and surface. How does this relate to DMF? When you apply a voltage to a liquid, you can change the liquid-surface adhesion strength. In other words, by applying a voltage to the right surface containing the right liquid, you can cause the liquid to spread out! This process is called electrowetting, and is one of the fundamental principles of Digital Microfluidics. Electrowetting is the process of applying a voltage to a surface (or electrode) in order to reduce the contact angle between liquid and surface. In other words, it’s when you use electricity to make a droplet spread out. The process is illustrated in the accompanying figure. 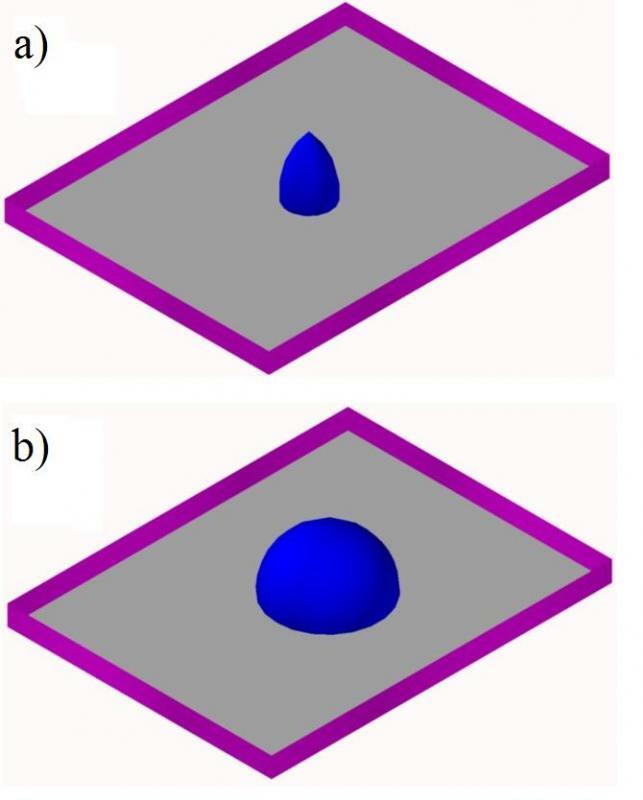 A droplet on a conductive surface (a) before and (b) after a voltage is applied. While DMF is a very new field, electrowetting isn’t. Electrowetting was first explained in 1875 by Nobel laureate Gabriel Lippmann, who showed that liquid mercury could be made to move up and down a capillary by controlling an applied voltage. Early applications of the technology, however, were limited. When you apply a voltage to a surface, it becomes an electrode, and when a solution is placed directly on top of an electrode, it experiences something called electrolysis (think hairdryer-in-a-bathtub – not good!). For more than a century, the threat of electrolysis mostly relegated electrowetting to the status of an academic novelty. A solution to this problem finally arose in 1993. The idea was elegant in its simplicity: since you can’t put a liquid directly in contact with electrodes, why not indirectly? This was the approach taken by Dr. B. Berge, who found that introducing a second layer of material between the surface and the solution prevents electrolysis while still exhibits the same electrowetting properties. The added material acts as a "dielectric" - a buffer between the liquid and the surface. This process was named Elecrowetting on Dielectric (EWOD) and is the driving force behind modern digital microfluidics. Digital microfluidics allows for the movement of tiny droplets with great precision, and there are a large number of applications for such technology. DMF can be used in computer cooling, and being able to guide a droplet anywhere on your processor board is highly advantageous. This allows computers to adapt as different components heat up by allowing cooling units to be placed further away from the major components of the computer, such as the central processing unit (CPU). Pharmaceutical companies and research labs also stand to benefit, as the testing and screening of biological compounds would both be much easier if they could be done automatically by a machine-controlled DMF device. Imagine a process that saves time, saves money, and gets you better results on your tests! So…what’s in a drop? With DMF, a drop of sample can run tell you if you’re sick, or it could be delivered to the right place at the right time to save your new computer from overheating, or it can be used to run a hundred biochemical tests and assays. Don’t underestimate the power of small things! G. Lippmann. "Relations entre les ph&eacute;nom&egrave;nes &eacute;lectrique et capillaries." Ann. Chim. Phys. 5, 494-549, 1875. B. Berge, "Electrocapillarity and wetting of insulator films by water", C.R. Acad. Sci. Paris, S&egrave;rie II, 317, 157-163, 1993.